Natural range Western Japan mainland and several adjacent islands, Amami and Okinawa Islands, Taiwan (western part), and middle to northern continental China. Habitat Rice field, stream, waterfront. Range in Japan Tonegawa and Watarasegawa River systems and Boso Peninsula (Chiba, Saitama, Gumma, Tochigi Prefs. ), Kanagawa, Tokyo, and several islands of Nagasaki Pref. (Tsushima, Iki, and Goto Islands). This species occurred on Tanegashima Is. in 2011 (whether established or was is unknown). Origin Possibly from mainland of Nagasaki Pref. to Tsushima, Iki, and Goto Islands. From somewhere in Japan to other non-native area. The Tokyo populations may be established by dispersal from northern non-native populations. Date 1990s in Kanagawa, Chiba, Tochigi, and Gumma Prefs. The first record in Tochigi and Gumma Prefs were Sep 1999, although this species had already infested in that time. The first records in Tsushima and Iki was in 2001 and 2003, respectively. In 2003, this species already infested. Route Accidental: Possibly hitchhiking on rice straw, soil, etc. Impact Potentially: Competition with native frogs. Native organism(s) affected: Native frogs occurring similar habitat such as Rana porosa porosa. Djong et al. (2011) A new species of Fejervarya limnocharis complex from Japan (Anura, Dicroglossidae). Zool Sci. 28(12), 922-929. 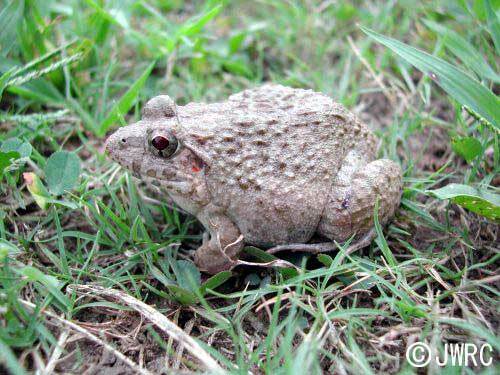 This species have spread rapidly in Kanto District, and further monitoring is required. One of the cause of the spread in Kanto District is possibly the climate change. Fejervarya limnocharis sensu lato distributed in India, SE Asia to East Asia has been devided into several species by a recent taxonomic study. The populations in Japan (except Sakishima Islands), Taiwan, and mid to northern continental China are placed in F. kawamurai. In addition, the genus Fejervarya is sometimes placed in family Dicroglossidae.